I love cruise ships. Love everything about them, From the shiny, shiny opulence and brilliantly swirly carpets to the joy and anticipation that happens when the little cruise newspaper appears outside your cabin during the evening allowing you to sit planning your activities the next day (while scoffing a late night biscuit rifled from the buffet upstairs – because cruise ships are also magical worlds where there is always cake and cookies!) I’m happy from the moment I set foot on deck until I have to leave with slightly wobbly sea legs. 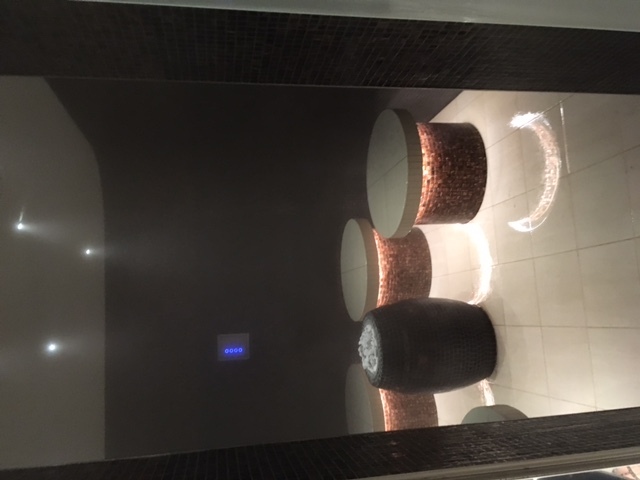 So I was very excited to get to go on part of the maiden voyage of the Majestic Princess, the newest ship from Princess Cruise line, recently to check out their healthy offerings – including the new Enclave thermal suite. It’s easy to be healthy on the Majestic Princess. You’ll find fun virtual reality bikes in the gym, relaxation zones with gorgeous sea views, a juice bar, a bar selling beauty-boosting tea and a massive salad bar should you get an odd urge for a bowl of grated carrot like I did. The ship itself is also enormous, 19 decks high and 300 metres long so you rack up steps just getting from A-B – there was 300 steps between my cabin and the cookie supply alone! However, what we’re focusing on here is the Enclave, Majestic Princess’ new thermal suite (aka, the fabulous room full of hot soaky places that make you super relaxed). Three times bigger than any other fabulous room full of hot soaky places that you’ll find in the Princess Fleet the Enclave is a lovely way to spend an hour or two. It reminded me a lot of the water area at Senspa at Carey’s Manor in the New Forest . The main feature you’ll spot when you walk in is the hydrotherapy pool. It’s about as warm as a bath and full of interesting buttons to push that switch on various contraptions aiming to shoot high pressure bubbly jets of water at any bits of you that might need soothing. Personally, I spent most of my time lying on the bedlike-bars at the back as the jets in that will hit pretty much of you in one go. When you’ve got muscles as tense as mine, you need that! Warning – there is no way to use the bubbly stuff in the hydrotherapy pool and not get your hair wet. I’ve seen people try, they fail! Ditto, getting water in your eyes – I always end up with glasses covered with splash marks. Scattered around the pool are the heat rooms – there’s three of these each with a slightly different USP. I admit it’s a subtle difference, so when I got home I had to look up in my special spa dictionary to determine exactly what the particular idea of each room was. There’s a Laconium which is a dry heat rather like a sauna, At first you don’t feel too hot in these, then the sweating starts! Then there’s the Caldarium which is the posh name for a steam room. This is a wetter heat and also uses scented oils. Finally, you have the Hamman which combines warm stone beds with steam for a totally immersive experience – that’s probably my favourite. After a while in that lot you need cooling off, or simply hosing down – which is where the rain showers come in. These range from icy torrent (helpfully named Siberian Shower to give you a glimpse into what you’re letting yourself if for) to the more soothing Tropical Rain. As well as different water temperatures, these also have varying light effects – and scents which was something I’d not seen before – to match their theme. If you’d prefer to relax out of water, there are heated stone beds to lounge on. My only criticism of it was it was perhaps a bit too heat focused – I would have liked a cold plunge pool I could soak my legs in to reset things a bit. I also only found the drinking water on my way out. Is it Worth Buying an Enclave Pass? If you’re staying in one of Majestic Princess suites entrance to the Enclave is included in your stay, but otherwise, you have to pay an extra charge to buy a pass for your stay (it was US$149 for seven days on the cruise I was on). This does however mean it’s actually pretty empty and a really nice place to relax – there was only two other people in there when I went in which considering the ship holds 3500+ people isn’t bad odds. I really enjoyed it and, if you were on a cruise with lots of sea days it would be a good investment. You probably wouldn’t use it every day, but considering a day pass to a spa would normally cost you around US$40-50 even if you only visit the Enclave half the time you’re on board it’s probably worth it. I’ve read reviews from people who said it was great to go and soak after coming back from long days sightseeing. The spa is open from 8am to 10pm so, depending on how you wanted to spend your evenings, it’s definitely an option for when you return back to the ship.. If you’ve just gulped a bit at that price, don’t worry – there’s plenty of other relaxation areas on the Majestic Princess. There’s hot tubs on the top deck and in the covered, adults-only, Hollywood Pool Area. You can also relax beautifully on seats and beds in the Hollywood Conservatory on deck 19 which also lets you watch the world float past. The only thing you can’t do anywhere else is steam yourself – but there again, next year Majestic Princess is basing herself out of Sydney for the Southern Hemisphere summer (September 2018 to March 2019) so, depending where your normal home is, you might find yourself quite warm enough! Click here more information on Majestic Princess and the Enclave. I was hosted on the cruise, but for a newspaper piece, not this blog – getting to write stuff on here is an added bonus!